What's New: With the 2.57 firmware and later versions, the new logic probes model: 701988 & 701989 are available. This analyzer meets various measurement and analysis needs. The DL7400 Series includes 4 and 8-channel analog input models. Each model has up to 16-bit logic inputs as standard. All these inputs come in a convenient, benchtop-sized instrument. In additon to capturing up to 16 logic signals, the DL7400 Series lets you simultaneously measure up to 8 analog signals without needing to synchronize two separate oscilloscopes. The DL7440 and DL7480 SignalExplorer oscilloscopes are designed for users who want an easy, efficient solution in one unit for handling measurements that required two or more units in the past. Even some oscilloscopes with high sampling rates may not be able to accurately capture waveforms if the memory size is not large enough for the required monitoring period. This limitation is due to the necessary drop in sampling rate, which occurs if the recording memory is not long enough. A larger recording memory not only increases the monitoring time, but also enables users to maintain a high sampling rate thus ensuring accurate waveform monitoring. In addition, the zoom function can be used to view enlarged images on one or two segments of a waveform captured in the large memory. When working with data captured in the large recording memory, the amount of information appearing on the display varies greatly depending on how the data are presented. The differences occur depending on whether you choose to display all points in a captured waveform, or just major values, such as maximum and minimum values, in a given segment on the waveform. The DL7400 Series provides fast screen updating in all-points display mode, so you won’t miss abnormal phenomena or have slow responses to instrument controls. When an abnormal signal is displayed on the screen, does it disappear before you can press the STOP key? The history memory function divides the large recording memory into a number of blocks and automatically saves up to 4096 previously captured waveforms. You can increase the number of screens that can be saved to history memory by setting a shorter record length. The history search function is useful for quickly finding abnormal waveforms in the large amounts of waveform data stored in history memory. This function lets you automatically search for desired waveforms based on whether or not a signal passes through a user-defined area on the screen. You can also conduct searches based on waveform parameters. Calculates statistical information based on the parameter values for waveforms stored in history memory. This function calculates and displays a parameter’s maximum value, minimum value, average value, and standard deviation. 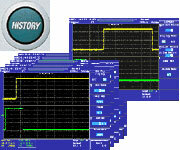 You can check the parameters for every waveform in history memory. Automatically calculates the maximum value, minimum value, average value, and standard deviation of selected waveform parameters for each period of a signal. You can even find the period corresponding to the calculated maximum and minimum values and display that period in the zoom window. In some applications, like with a PWM (pulse width modulation) control signal, you may need to determine information about each waveform period for long amounts of time. 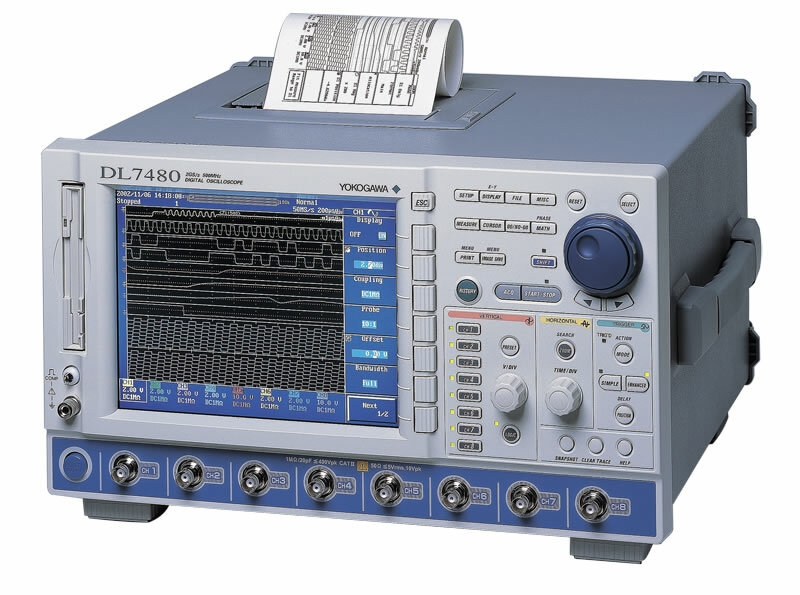 The DL7400 Series with its long memory, lets you analyze a long waveform, period-by-period, based on the period of a reference signal. How can I quickly count a large number of pulses in waveform? Automatically counts the number of pulses in the waveform data between cursors. The threshold level for recognizing a single pulse is user-definable, so you can reliably compute pulses even in signals with unstable levels. With the DL7400 Series, you’ll never again have to manually count pulses on screen or on a stack of printouts. 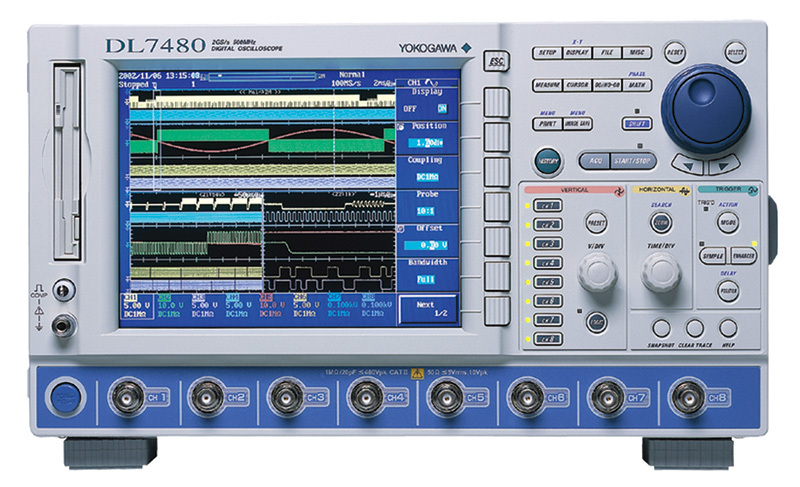 The many trigger types in the DL7400 Series enable stable monitoring of a wide range of waveforms. Easy, automatic calculation of power supply parameters including: switching loss, power, power factor, impedance, energy, and more. From the main power analyze setup menu, you can select which channels will be used for power measurements. For each channel selected, you can choose from a number of waveform parameters specific to power analysis. (For example, I2t can be calculated for fuse measurements). Additionally from the main power analyze setup menu, you can jump to the Auto Deskew function or the Power Analysis Math and Parameter Measurement menus. ¹ The Power Analysis Functions (/G4 option) includes the User-Defined Math (/G2 option). Fluctuations in waveform parameter values of acquired signals are displayed on a plot. For example, on an active power factor correction circuit, you can simultaneously display fluctuations in the switching frequency and switching current of the modulating signal relative to the commercial power supply and input voltage. Also, you can measure commercial power supply voltage and current and then display the trend of power consumption over each cycle. You can measure commercial power supply voltage and switching voltage/current in active power correction circuits, and also plot fluctuations in switching frequency and switching current. Limit values based on EN61000-3-2 class A, B, C, and D can be superimposed with measured data. Limit values and numeric data values are displayed together in a list. Data exceeding the limit value are flagged. 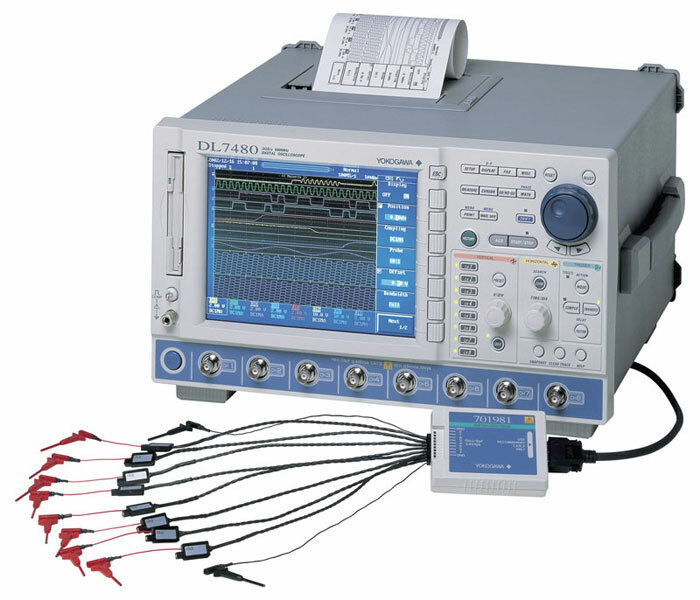 ² You can use the DL7400 for pre-complaince testing. 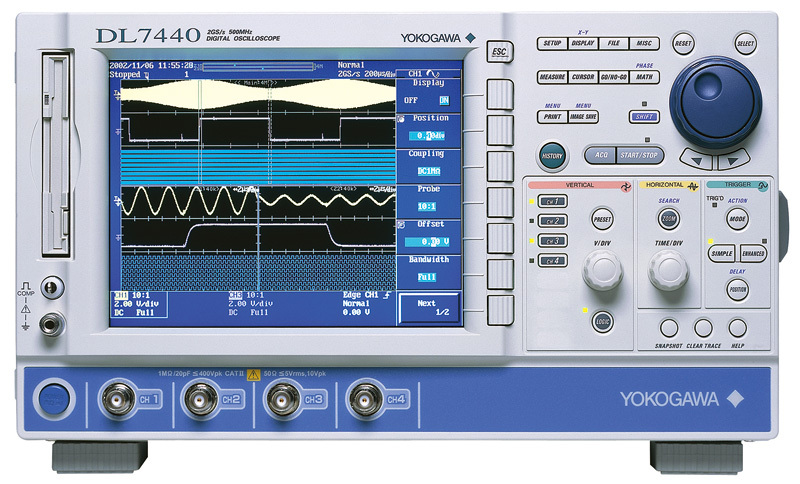 Use Yokogawa's WT2000 Digital Power Meter for standards compliance testing. Adjust for differences in electrical length (skew) between voltage probes and current probes. This is useful for switching loss measurements and other measurements affected by voltage/current signal skew. Deskew can be performed automatically or manually for each channel. The DL7440 and DL7480 include addition, subtraction, multiplication, binary conversion, inversion, differentiation, integration, and power spectrum as standard calculation functions. With the optional user-defined calculations, you can define equations using arithmetic calculations as well as a variety of other functions, including trigonometric functions, differentials, integrals, square roots, digital filters, six different FFT functions, and pulse width calculations. 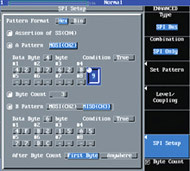 In addition, calculation results can be specified as parameters for other equations, so the DL7440 and DL7480 can directly handle complex computations that formerly required data to be uploaded to a PC for computation. Three serial bus analysis functions (I2C, CAN, and SPI) are available together "in one instrument." 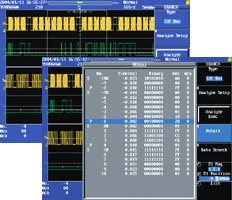 These options provide physical-layer observation and analysis of serial bus signals. Evaluations from such analyses are essential to solve communication failures resulting from signal deterioration and unpredictable external noise. I2C bus signals (SCL and SDA), used extensively in home electronics such as analog and digital televisions, and video cameras, and in communications equipment such as mobile phones can be captured with specialized triggers and displayed as waveforms. Triggers can be based on start conditions, userspecified address and data patterns (Data 1 and Data 2), non-ack (when acknowledgement is not received), and other conditions for reliable capturing of I2C signals. You can also set triggers based on combinations of I2C bus trigger conditions (SCL and SDA) and signal inputs on channels 3-8 (combination triggers). Captured waveforms can be analyzed in a time-series manner, and the analysis results at each byte is displayed in a list along with the presence/absence of ACK field codes. When an analysis result is selected with the cursor, the corresponding portion of the waveform is automatically enlarged in the zoom area. You can quickly search the analyzed results for a specific address or data pattern from within the analysis results. Two pairs of I2C busses can be input at the same time (SCL: CH1 & CH3; SDA: CH2 & CH4), and then analysis can be performed alternately on either bus. Using dedicated triggers, CAN bus signals can be captured and displayed as waveforms. (The CAN bus option supports both highspeed and low-speed CAN. CAN is used widely in the internal communication busses of automobiles, FA machinery, medical equipment, and other devices.) Analysis performed according to the CAN protocol can be displayed in a list together with the waveforms. Two types of differential probes are available for measuring CAN bus signals (sold separately). Trigger conditions can be set from fields or combinations of fields in CAN data frames (ID, Data, RTR bits, etc. ), enabling reliable capturing of CAN bus signals. Triggers can also be activated on an error frame. Captured CAN bus waveform data can be analyzed in a timeseries, and the ID and Data at each frame displayed in hexadecimal or binary notation. 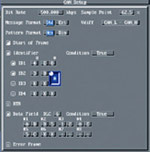 Frame and error types can also be displayed simultaneously. By selecting a frame with the cursor, you can display an enlarged version of the corresponding portion of the waveform on the screen. Search the analysis results for a specific CAN frame—ID, Data, Remote (RTR) or Error frame. The specified field is automatically identified and displayed in the on-screen zoom window. Signals in the SPI bus, a synchronous 8-bit serial bus widely used for inter-IC and data communication in embedded systems and in other applications, can be captured using dedicated triggers. 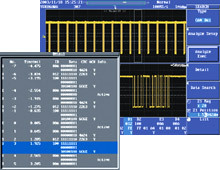 The captured results are then analyzed based on the SPI protocol and can then be displayed together with the waveform. Triggers are activated on user-defined conditions of the MOSI (master output slave input) and/or MISO (master input slave output) data signals on the SPI bus. Data strings of 1-8 bytes can be defined. Two types of trigger patterns can be set (A pattern, B pattern, or both), allowing a trigger to be activated, for example, upon data read out from the slave (MISO, pattern B) in response to a specific command from the master (MOSI, pattern A). Data analysis results and SS (slave select) bits can be displayed in a list together with the waveforms. After analyzing the acquired data, you can perform high speed searches for a specific MOSI or MISO data pattern (1-8 bytes). * The SPI bus analysis and search functions are standard features. The SPI bus triggers are available only as an option. Using the Windows XP WebDAV* function, the DL7400's internal storage media drives (floppy, ZIP®, PC Card) can be mounted as a PC network drive. Using your PC, you can then access stored data on these drives as easily as you would access data on the PC's own hard drive. This feature does not require any external FTP client software. With an Ethernet connection, you can perform various functions using Internet Explorer. Easily copy and paste files from the internal storage device in the DL7400 Series. This internal storage device functions as one of your PC file servers. 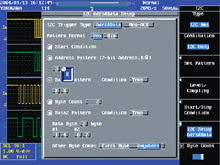 Perform actions such as waveform monitoring, uploading settings, and starting/stopping measurements. Automatically opens Excel, then periodically downloads waveform parameter values and graphs them. Easily monitor parameter trends during extended-period measurements. The screen image can be printed on a network printer in the same way as you would print to the internal printer or a USB printer. The information of the DL7440/7480 can be transmitted periodically in an e-mail message to a specified mail address. The DL7400 Series can be completely controlled using a USB mouse. File names can be entered using a USB keyboard. Connect a USB printer for color printouts. Connect a USB flash memory for saving a variety of data (ACQ data, setup data, image data). You can create a PC program to remotely control your DL7400 Series through a PC, similar to remote control operations through a GP-IB interface. The PRINT key lets you print screenshots to the built-in printer, a USB printer, or network printer. Simply press the IMAGE SAVE key to save a screenshot to a PC card or other storage device. Screenshots can be saved in BMP, TIFF, PS, PNG, and JPEG formats. Captured images can be easily checked as thumbnail icons. File names are displayed together with the thumbnail images, allowing you to check files and immediately change their names or delete them if necessary. Probe power connectors for active probes and for the 701935 Deskew signal source. The DL7400 Series comes standard with 4 connectors. 4 additional connectors can be added as an option. Outputs a video signal for viewing waveforms on an external monitor. Complies with USB Rev 1.1. Type A connectors: 2 ports compatible with USB Flash memory*, HD drive*, USB printers, keyboard and mouse. *: Available only when the following description is included in the Misc → Overview menu. Complies with 100BASE-TX and 10BASE-T.
Inputs DC to 100 MHz signal for external triggering (external trigger input). Inputs clock signal from 40 Hz to 20 MHz from exterior (external clock). Trigger occurrence can be controlled using external signal (trigger gate input). Outputs TTL level trigger signal. Hardware for extending rack capability. Detailed dimensions follow. For use with the Power Supply Analysis option (/G4).